I am hoping that someone might be able to translate either one or both of these signatures and seals. 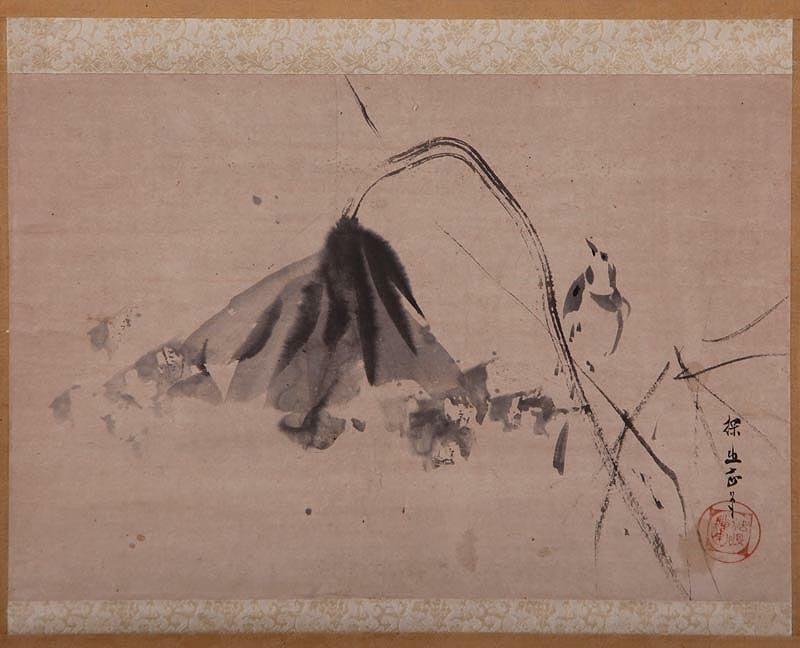 The second signature reads 'painted by hôgen Shûhô at the age of 78 years' and refers to Mori Shûhô (1738-1823) a well known Japanese painter from Osaka. The work dates from 1815 (years counted from day of bitrh in the Japanese way). Can anybody identify this mark by chance? Here is the pictures that I forgot to post on my last post. Last try, my pictures wont upload for some reason. I tend to read the first two characters of the first signature as 'Tanzan' (探山) but I'm not sure about the third character. The fourth kanji is 'hitsu' (筆) or 'painted by'. 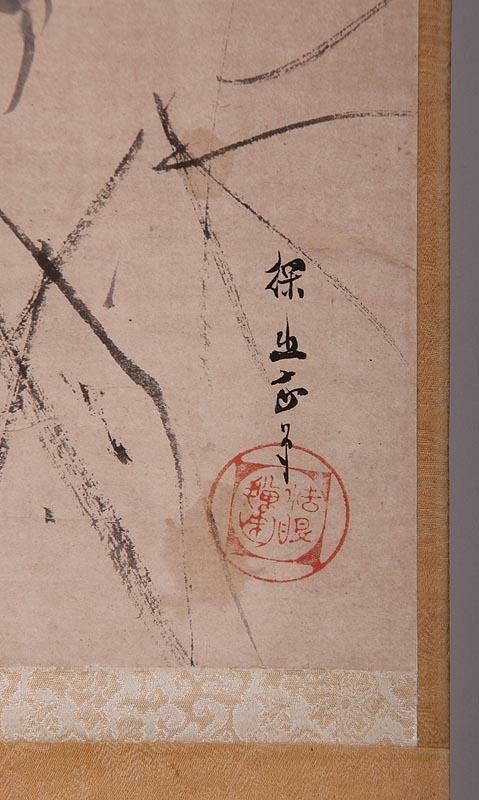 Possibly, this signature refers to Tsuruzawa Tanzan (1655-1729) or a later copy of a painting by this Japanese artist. Cfr with the signature ('hôgen Tanzan hitsu') of a Tanzan scroll in the collection of the MFA Boston (cfr link below) and especially the rendering of the characters 'tan' and 'hitsu' in both works. Guy, I think the third character is supposed to be "upright"/"correct", in Japanese "sei" or "tada(shi)". So a "real/true painting" by Tanzan? I think you are right. The postfix 'shôhitsu' (正筆) - 'real/true painting' was used by artists on Japanese paintings and surprisingly even on woodblock prints in the 18th century. In this case, it could be an indication that this is an original and not a later copy (not a fake, but a faithful copy painted by a pupil). So, the complete signature in cursive should read 'Tanzan shôhitsu'. The seals of the two paintings remain unread by me, but they are an important element for eventual further authentication by someone who has the knowledge. 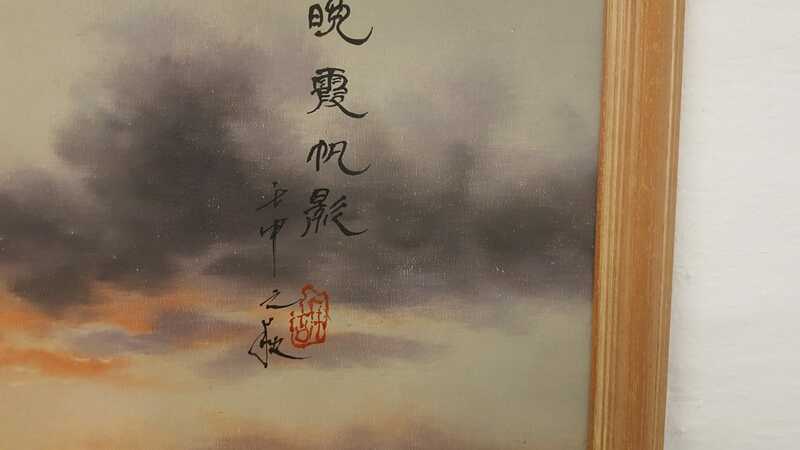 I've been looking at a number of paintings and I wonder if the second signature could be read "Kano Tan'yu". It does seem to match a number that I've found in the Boston MFA, Harvard Museum, Metropolitan (see link), etc. The seal also matches somewhat, but is messy and maybe slightly off, possibly suggesting wear or a copy/fake? Hope you get this. Spot on Willie! Bravo! It is Kanô Tan'yû and the seal does match for sure with the one on an ink painting in the British Museum (cfr image). I see no real differencies. 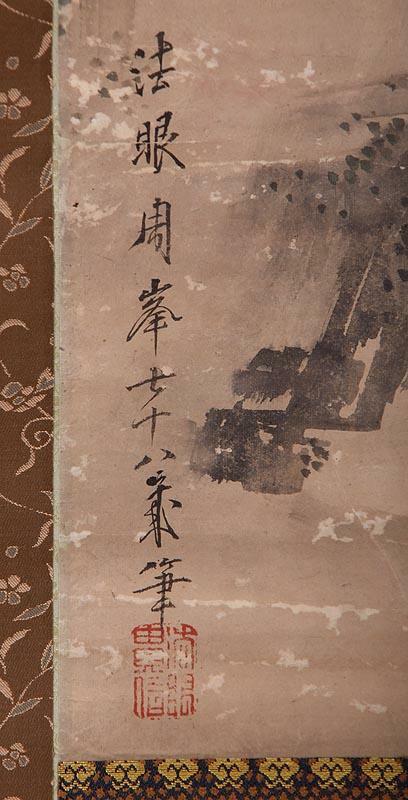 The BM description states 'Claimed to be by Kano Tan'yu' (ex Arthur Morrison collection). 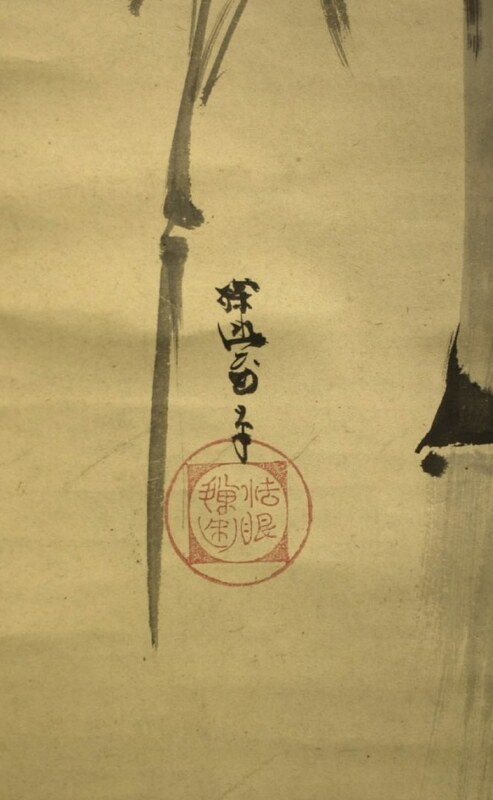 The full signature reads 'Tan'yûsai hitsu'; the seal reads 'hôgen Tan'yû'. Thanks for the confirmation. Yes it is fun but I really do need to learn the language. I posted an image of the painting. Thought you might be interested in seeing more than just the signature. Once again I owe you. Maybe someday I'll learn enough to be able to return at least a little. Until then, much thanks. Couldn't resist to have another look at the seal of Shûhô and I believe it must be read as 'hôgen Takanobu' (法眼貴信) - 'hôgen' being the honorary title and 'Takanobu' the artist's surname. The characters in the right hand part of Tanzan's seal read also 'hôgen' - the left part remains unread by me. really it looks an uber cool zen masterpiece. why not post the painting itself? the art is not all about the signature!! one look at the picture itself & it will be blatantly obvious whether a commercial or zen work. 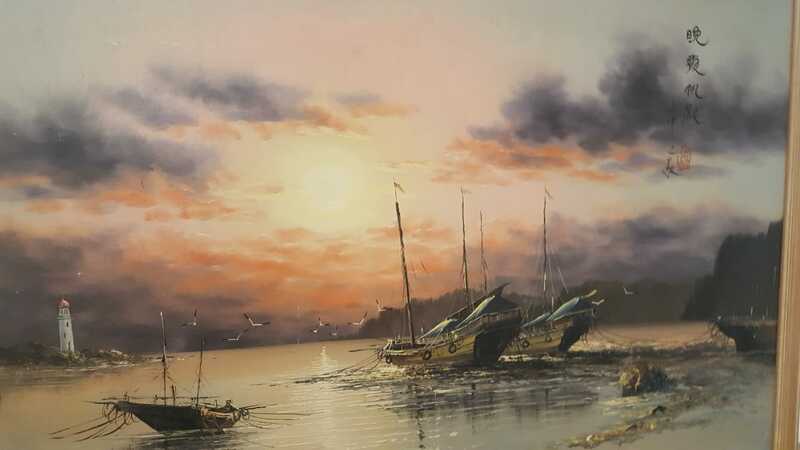 I am assuming you are refering the the Kano Tan'yu signed painting. The image was posted above, Sept. 27 (Bird on wilting plant/flower). I wouldn't necessarily know a masterpiece but this doesn't appear commercial to me. I am, however, pretty new to all of this so I really appreciate hearing what others think. Thanks for the interest. Hi, just replied to your post assuming your interest was in the Kano Tan'yu painting. Just in case I was mistaken here is an image of the Mori Shuho piece. Please could someone identify this print for me. My sister found it in the loft when she moved into her new home.